Very stylish and modern. Love this watch! Gold-tone stainless steel case and bracelet with rose-tone gold center links. Fixed bezel. Rose-tone dial with gold-tone hands and index hour markers. Quartz movement. Mineral crystal. Push/pull crown. Case: diameter 42mm thickness 8mm. Band: width 20mm. Pushbutton clasp. Water resistant up to 50 meters/165 feet. Functions: hour, minute, second. 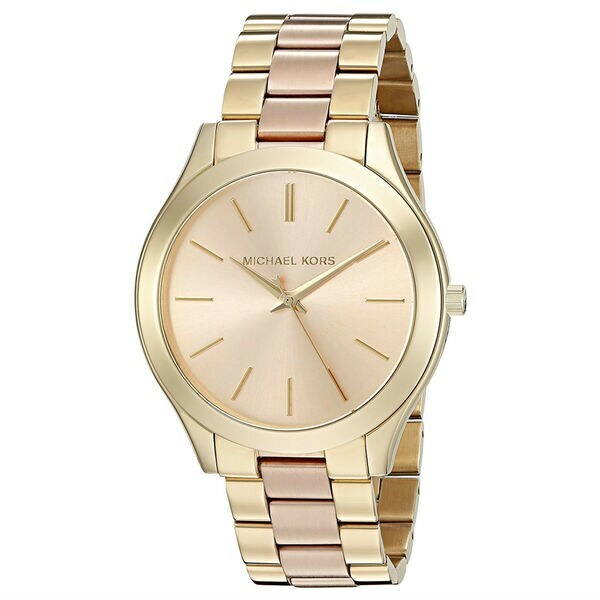 Michael Kors Women's MK3493 Slim Runway Rose-Tone Dial Two-Tone Stainless Steel Bracelet Watch.All measurements are approximate and may vary slightly from the listed dimensions.Women's watch bands can be sized to fit 6.5-inch to 7.5-inch wrists. Dimensions Case: diameter 42mm thickness 8mm. Band: width 20mm. looks great! The rose gold goes with my skin tone. I am obsessed with Michael Kors watches, I have every a nice collection, but I usually pay a lot more at department stores! This was a terrific price And beautiful watch, highly recommend! I love watches, and since I don't carry my cell phone with me everywhere, I still watches. This one is very feminine, even though it is oversized, although not huge. Just a stunning watch that I highly recommend. This watch looks cheap and the two tone colors don't look like picture at all. I am sending it back the same day I received it. Very disappointed!!! I love it!!! Exactly as pictured!! I love the way it compliments my gold and rose gold jewelry. I purchased this watch for my mom for Christmas. It is a very pretty watch. I would say for casual use. My mother loves the watch and uses it frequently. She does not use it at work though. This is a really pretty watch - fairly big face on my wrist, but not too big. Beautiful color. This watch is lovely. Not bulky like some MK styles and it makes a nice, classy statement with any outfit. nice watch for my wife!! !